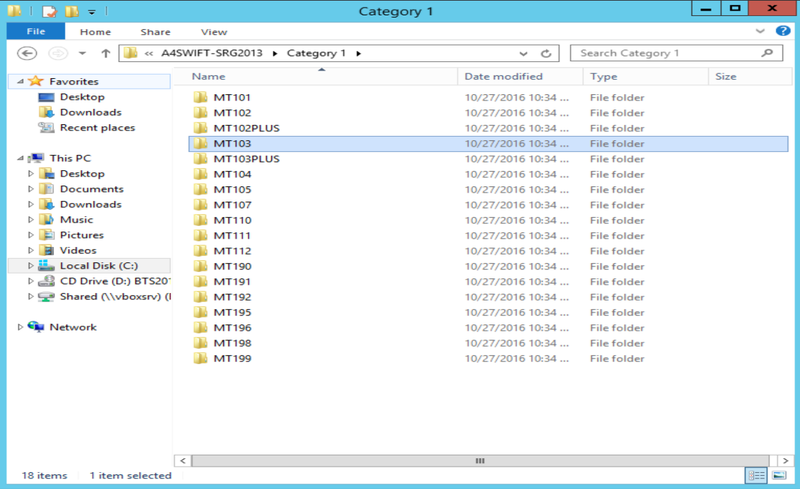 Navigating into the BizTalk Accelerators from here brings us to a folder with a number of different accelerators, but we can get to the installation wizards by just starting the Setup application below. The Setup screen gives us access to installation wizards for every accelerator in this directory. 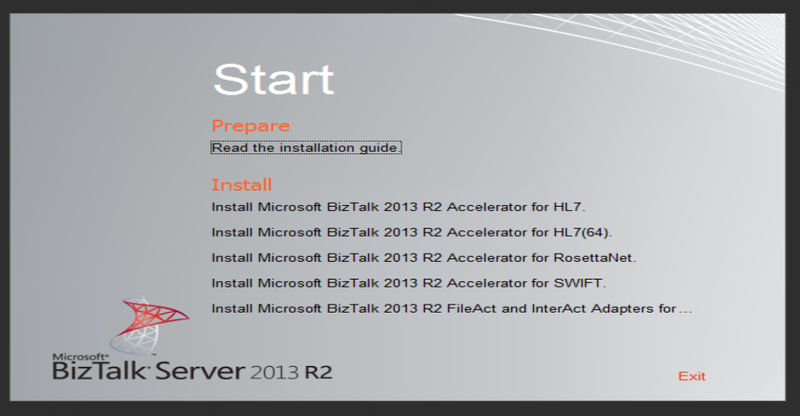 We’ll go ahead and click “Install Microsoft BizTalk 2013 R2 Accelerator for SWIFT” here, to move on to that installation process. Now that we have the SWIFT accelerator installed, we can move along to creating a simple application to test out some of the features that are now available to us. As one would with most BizTalk projects, we’ll start by adding some schemas. The SWIFT accelerator provides us with a plenty of schemas that we can leverage in order to speed up and help standardize our SWIFT development tasks. As you can see below, there are a number of different categories of schemas for us to choose from. We’ll go into these in a moment, but first we’ll navigate into the Base Schemas folder. This contains some of the base types that are used by the more specific schemas that we’ll be adding later, so we’ll go ahead and add both of these files into our schema project. 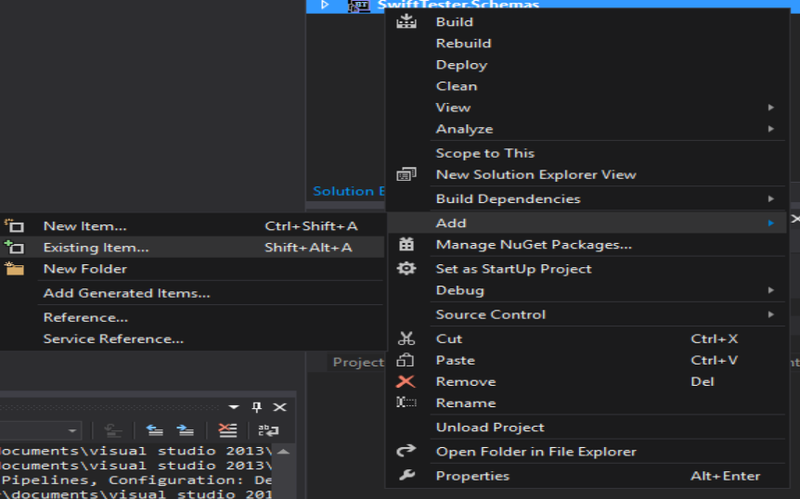 Going back to Visual Studio for a minute to do this, we’ll right-click on the schemas project, go to the “Add” menu, and select “Existing Item…”. 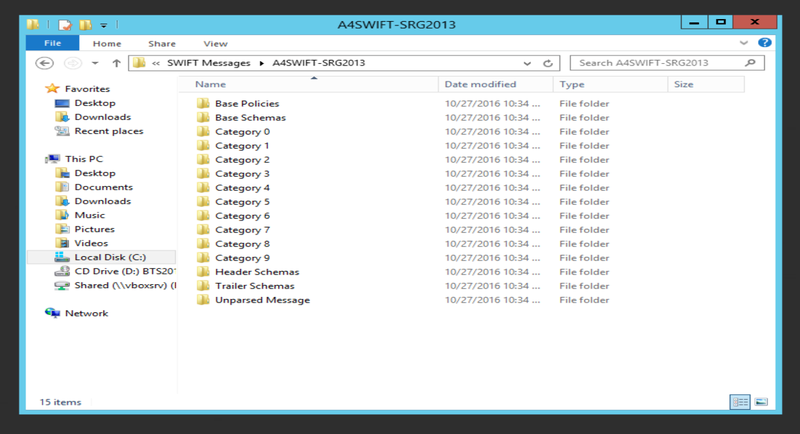 Then we’ll navigate back to the Base Schemas folder, select both “SWIFT Base Types” and “SWIFT Common Data Types”, and click “Add” to add them into the project. Once we’ve done that we’ll navigate back into the previous folder and follow the same process to add a category-specific schema. For those of you who are new to SWIFT messaging, these categories correspond to a number of different transaction types within the SWIFT standard. Some of the categories are for transactions within treasury markets or security markets, but for the purpose of simplicity, we’ll stick with Category 1 for this application, which is used for Customer Payments and Cheques. Even within this folder there are a many different message types. A quick peek at the SWIFT User Handbook shows us some of the different uses for these message types. 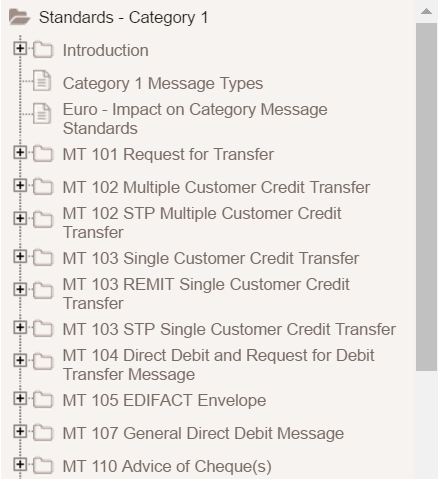 For further information, you can go to https://www2.swift.com/uhbonline/books/a2z/standards_mt.htm and check out the latest standards for yourselves, but for our purposes we’ll be working with MT103, the message type for Single Customer Credit Transfers. Business rules and envelope schemas are outside the scope of this sample app, but the SWIFT accelerator provides us with infrastructure for them as well, as you can see in the image above. For now, though, we’ll go ahead and just grab the “MT103” schema file and add it to the schemas project so we have a schema for our sample application to work with. Inside it, we’ll add a receive pipeline and a send pipeline for us to work with, as well as a reference to the SwiftTester.Schemas project from earlier. The MSDN documentation lists the above features. For more information on the disassembler itself, check out this article. 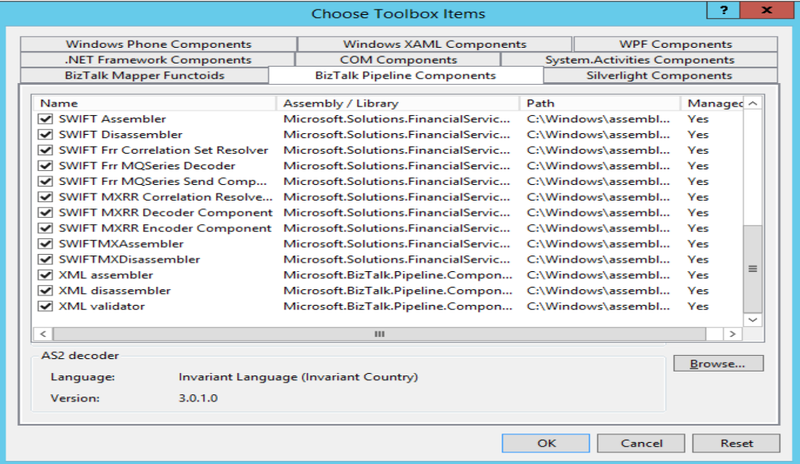 Some of these features can be modified or enabled/disabled by settings in the properties window. Some of them are SWIFT specific, such as the SWIFT Header Schema, and the SWIFTBound property promotion toggle. We will actually disable BRE Validation, since this sample application won’t be using that feature. There are also a few other components that could be useful outside the scope of our application, including a couple decoders and an additional disassembler for the MX standard as opposed to the MT standard that we are working with in this application. The MX standard is a newer standard which uses xml-style messages and is intended to be more flexible than the older MT standard. This disassembler could easily be switched out for the MX version, depending on what types of messages the system is going to be receiving. Now that we’ve updated the receive pipeline, we’ll do the same for the send pipeline as well, following the same process with the SWIFT Assembler component this time. The assembler has less functionality than the Disassembler, by its nature. 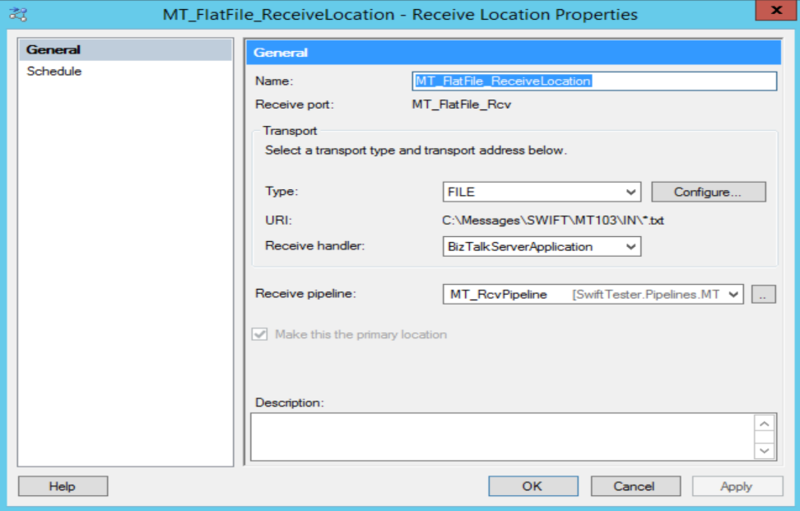 Its main functions are to resolve the outbound schema using the discovered message type and serialize the message into the SWIFT flat file format. More information on this component can be found here. Once this is complete, we can go ahead and build, deploy, and start using these pipelines in our application. These assemblies contain additional validation and other functionality which can be very helpful when handling SWIFT messages. Now that we have some schemas and pipelines in place, we can create a simple application to test out some of the SWIFT accelerator’s functionality. We’re going to use these artifacts to create a simple publish/subscribe architecture. 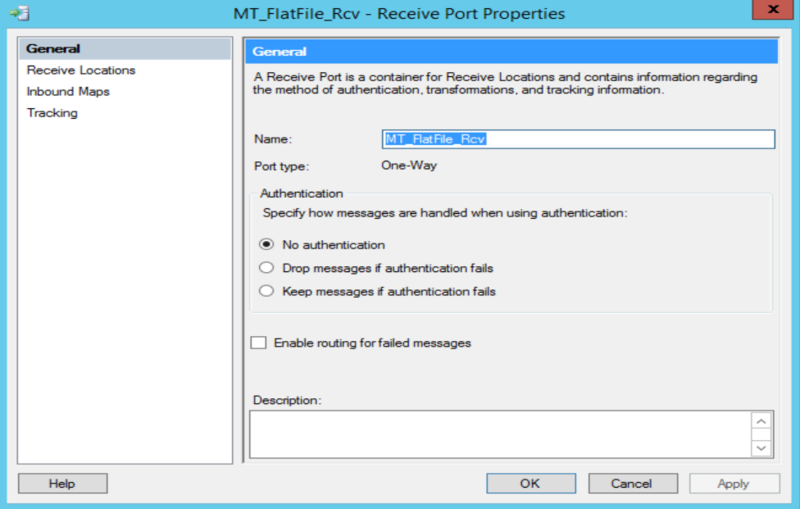 To start that off, we’ll go ahead and add a receive port and a receive location for MT files. 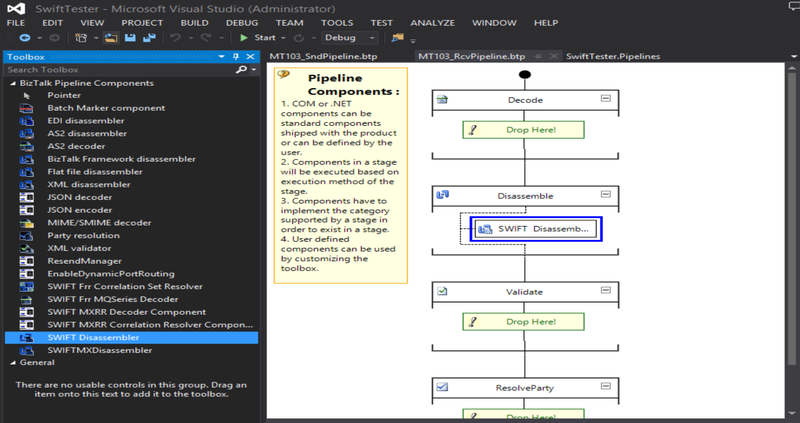 Note that we’re using the receive pipeline we created earlier, so we can take advantage of the SWIFT disassembler. If we were inclined to do so, we could create a map as well to map to some internal format, using our MT103 schema. Since the purpose here is just to test out some of the artifacts we created, we’ll also create a send port that picks up the file from the receive port and sends it through to a destination folder. 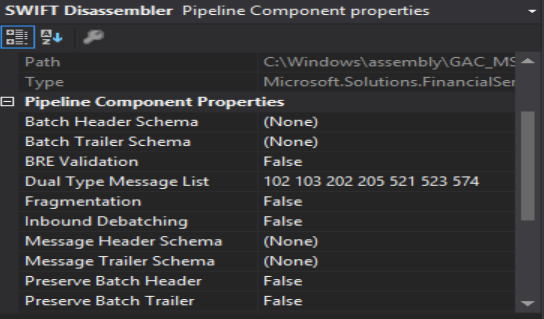 This will give us a chance to test out the pipelines on any valid MT103 file. 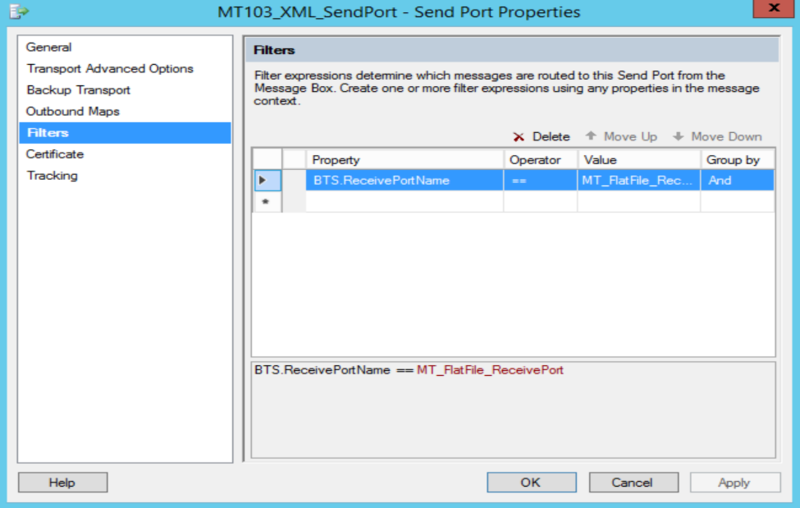 Now all we have to do is start up these ports, and we should be able to send a sample message all the way through. 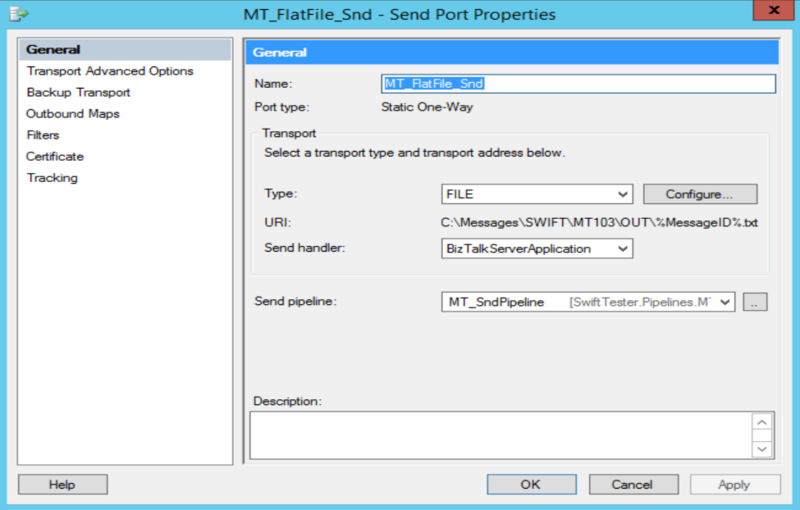 Hopefully, this guide has provided a helpful base for creating a BizTalk application that can handle SWIFT messages. It should be fairly easy to add new artifacts from here to enhance the application and provide some solid integration with SWIFT-centric platforms.